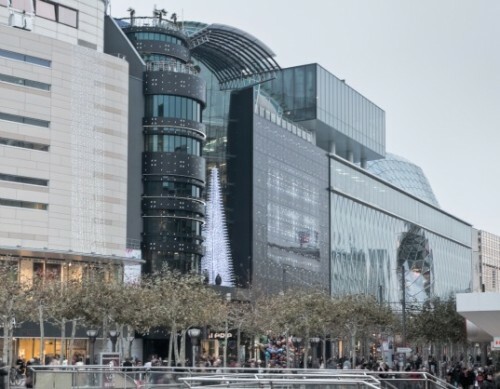 The Zeil is Frankfurt’s main shopping district, a pedestrian-only street bordered by two large plazas. In 2009, Massimiliano Fuksas’ vortex-clad Mab Zeil mixed-use center brought a new face to the street. Not to be outdone by its neighbor, the Zeilgalerie shopping mall began its own facelift the same year. Designed by Wiesbaden, Germany-based interdisciplinary collective 3deluxe, its LED-illuminated black facade brings a new sense of unity to the street and was recently given the Red Dot 2011 design award in the category of Information Design/Public Space. Originally designed by German architects Kramm & Strigl and completed in 1992, Zeilgalerie was an architectural mix consisting of a glazed semi-cylindrical structure and central entrance tower, to the right of which was a perforated aluminum facade. To make the building read as one structure without losing its original forms, designers at 3deluxe envisioned three all-black facade systems composed of glass and aluminum. 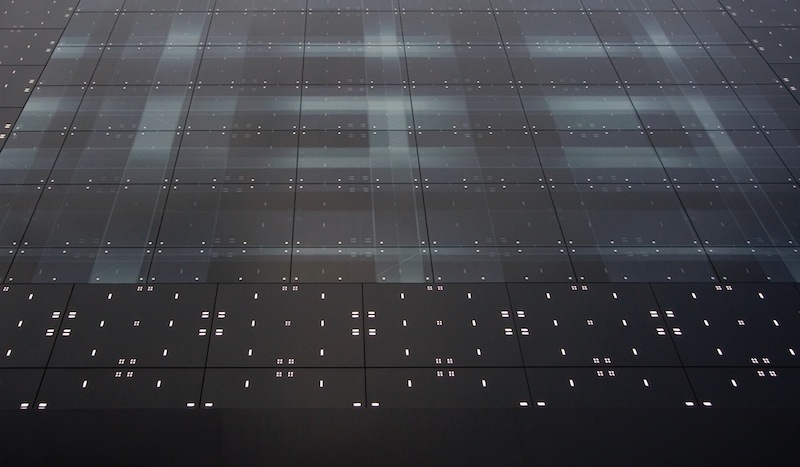 The sleek building envelope would be the new canvas for a light installation showing off the latest capabilities in LED technology and multimedia design. The media installation spans the rightmost structure’s entire 2,800-square-foot façade. 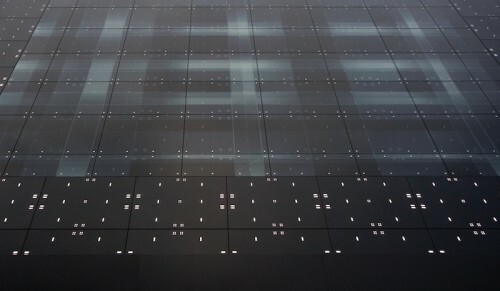 Double-glazed black glass panels are mounted flush with matte black cladding, behind which a rhomboid grid of 310 LED strips applied to the exterior glass pane creates the computer-controlled lighting display. Each of 19,700 diodes can be controlled separately, allowing the facade to project sharp geometric patterns as well as abstract shapes and the illusion of light and shadow drifting across the building. The facade performs at night (with music). Diagonal lines of light are superimposed by an orthogonal pattern printed onto the transparent film between glass panes. Corresponding to the pattern that is laser-cut into the metal cladding, which itself includes 2,500 LED modules, a dot screen ties the entire display together. The dot screen is repeated in the cylindrical structure to the left, which is clad in horizontal strips of matte-black aluminum outlined on the lower edge with more LEDs. Viewed as a whole, the facades take on a uniformly dark appearance in daylight, but slowly become three pronounced structures at night, each playing off the others’ patterns. Media design firm Meso Digital Interiors created the program to run the lighting display. “The complex layout of the LED fixtures called for a bespoke mapping system, which prepares all of the graphics for the Leurocom-built installation with sub-pixel precision,” describes the team in its design brief. Using graphical programming toolkit VVVV, Meso programmed scenes that would play “hide and seek” in the building’s contours, ensuring that no two performances are ever the same with software that calculates new frames for infinity.